the trick or treat waddle! wishing you all a happy and safe halloween! come by and visit tomorrow and see pictures of us all dressed up for tricks and treats tonight! thank you for putting up with this brief interruption and i promise to resume with the crafty blogging tomorrow! it is CaRnIvAl time again!! to celebrate i lovingly stitched up this tiny tote and will send it off to one lucky person at the end of the week! 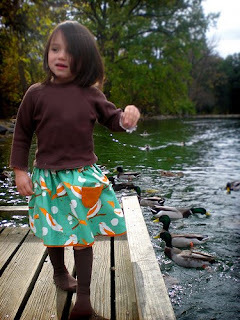 the outer is 100% cotton in a beautiful tree print~ the bag is lined with organic cotton and has a handy pocket inside. it is the perfect size for little ones to carry their favorite toy, a tasty snack or any treasures they pick up while out and about. the button "leaves" have been securely sewn on and are backed with hemp fleece to keep them in place. esme' (that is her modeling this sweet little tote in the photo above) would like to contribute to this giveaway too. to win simply leave a comment on this post and tell us a little bit about who you would give this tote to~ you must live in the united states to enter. we will randomly choose a winner at lunchtime on friday october 31st (halloween!!) and based on your comment esme' and i will pick out some random goodies to put in the tote before we send it along! please make sure i can contact you via your blog or e-mail, in case you win. good luck and thanks for stopping by! #62... that is Gina who said her 4 year old daughter would love this little bag!! thanks to all who entered! check back often for more fun giveaways and for more of these adorable little totes! as for the second tote, it is currently full of kids. apparently that is the best seat in the house for movie watching. i spent this morning sewing for a special giveaway~ here is a little sneak peek! come visit me in the morning for details! yes, we most definitely need this collection in our closet! don't you think? GROSGRAIN MINI STORE OPENING NOVEMBER 6!!!! AND BIG PREVIEW GIVEAWAY!!!! niko is feeling better. we attempted to video blog an update about her recovery with no luck. my camera malfunctioned... twice. harper ran up and grabbed the camera in the middle of our third video. then we finally got through the fourth with no mishaps only to have it refuse to upload!! the last time we did it we were pretty loopy and probably hard to understand anyway. the best one is actually the one where harper swoops in mid video and runs away with the camera. maybe one of these days i will get that one posted here for your entertainment. we visited the orthopedic surgeon yesterday and she believes that niko's arm will heal very nicely with no surgery. she will go back in three weeks for more x rays to make sure it still looks okay. they decided to not cast it, so she will just wear the sling for 5-6 weeks. she is still really sore but it is getting better each day so that is good. she was given a doctor's note excusing her from school the rest of this week and from PE for 6 weeks. we had a great idea to try to get the doctor to also write a note saying that niko was unable to wear her school uniform for 6 weeks, but that was a no go. so she will be returning to school monday, wearing her sling and uniform. the school counselor is going to assign a "buddy" to help her during the day since she cannot use her arm at all. this person will follow her from class to class, carry her books and help her get her lunch. niko, of course, is mortified like any 12 year old girl would be! she is very upset that she cannot play her bass clarinet for several weeks. she said that is the very worst part of being injured. that and not being able to hold her baby brother. the picnic table performance is apparently her last. she said she will not be doing any pretend hannah montana shows ever again. we'll see. niko, our 12 year old, broke her arm yesterday. it is a humerus fracture, right up at the top of her arm near her shoulder. ouch! they cannot cast it so it is in a sling and we have to visit an orthopedic surgeon tomorrow morning. she was doing a little pretend hannah montana concert with esme' on top of the picnic table in our back yard and fell off. tony watched the whole thing happen. being a pop star is very dangerous work, evidently. please keep our family, especially niko, in your thoughts as it looks like she is in for a rough couple months ahead. and i will be sure to keep you all updated as she heals and recovers. it has been a pretty lazy weekend. no big news to share. nothing exciting to blog about. my dog has spent the entire afternoon following the sunny spot around the living room. i must admit i've been tempted to find my own sunny spot and settle in for a little nap. but instead of napping i have spent my lazy afternoon knitting. i have a pair of wool pants started for harper and i cast on my mittens last night! that is them there on the right, in green and blue. harper's little pants are on the left. so there you have it, that is my weekend... my gloriously lazy but warm wooly producing weekend! 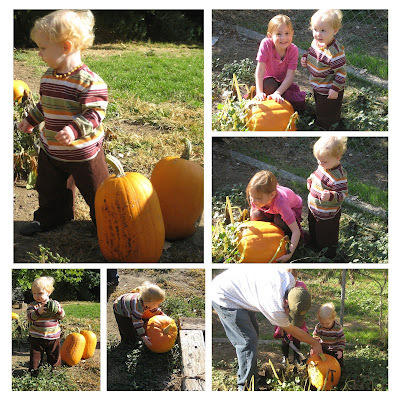 we harvested our pumpkins today. there were 6 nice, big pumpkins that escaped the feeding frenzy of the neighborhood squirrels. the biggest one weighed 26 pounds, the smallest weighed 12 pounds. harper tried to lift each one and finally decided that a little acorn squash was more his size. esme' was enthralled by the earthworms living under one of the large pumpkins. our yard suddenly looks different, empty as we put the garden to bed until spring. we are already discussing and planning next year's garden. maybe we will move the squash plants to another bed. perhaps we will plant something new. stepping stones made as a family would be nice. but right now we have a whole new season to enjoy while we plan and daydream. i finally took pictures of the hats i knit for the girls. esme' designed her own hat. she told me how wide to make the stripes, where to put each color, and of course the little tassel was her idea too. she seems to be very happy with it, so i think we can call the esme' hat is a success! this is o-wool balance in teal and pink. i knit a pixie hat for niko. she wanted a hat just like harper's. she requested natural yarn which surprised me a little (okay, a lot!) considering the amount of brightly colored wool that fills this tiny house of ours. but the off white merino actually knit up beautifully and she loves her hat too. moving on from noggins to finger tips, i cast on mittens tonight! they are knitting up super fast... and super cute! and while browsing patterns on raverly this evening i decided that very soon i will take a break from kid knitting and knit some mittens for mama... i deserve it! our snow is gone. it was still on the ground when we woke up the next morning, then we watched it slowly melt away. when we sat at the dining room table for lunch we saw the last large chunk of snow fall from the top of the play set. it has been cold and windy but i saw the forecast this evening and they are predicting temperatures close to 70 degrees again by next week. i feel like i am getting one last chance to sun the diapers, shake out the area rugs and air them out, and paint the walls with the windows open. i finished knitting esme's hat on friday but could not find the camera to take a picture before she left for school (it was in my knitting bag, of all places). i completed niko's hat tonight but she was in bed when i weaved in the last yarn tail. i can't wait for them to wake up in the morning so i can take photos. and tomorrow i am going to start mittens for the little ones. the next time snow falls we will be ready, no doubt! my shop is freshly stocked with some brand new, harvest inspired colorways! so stop by and pick up some warm wool before the first frost arrives! maybe you need some pumpkin soup socks, or a haunted kettle hat to keep you and your little ones cozy this season. a little more of the same~ this is yet another giving pixie hat, but this time with matching mittens! my girlfriends and i get together one evening each week to knit at a nearby starbucks and we recently found out that the manager's wife is expecting their first baby any day now! so this little set is for the starbucks baby! i should mention that the baby's gender will be unknown until he/she makes a grand entrance into the world~ i know, i know, i could have picked a more gender neutral color. for some reason this is the skein of yarn that seemed to be calling to me though... a sign that a baby boy is coming? i guess we will soon see! the recent autumn rain fall and cooler temperatures have brought many changes to our yard. like fresh wildflower blooms! i don't think i have ever seen them this pretty and perky in october! and the virginia creeper vines that were the back drop for the photos in my last post are turning more and more scarlett every day! i wish that red could stay through the entire season. but, unfortunate for us, they love pumpkin too! hat season is rapidly approaching so i have started the yearly task of knitting a new hat for each member of the family. i decided to knit them in the order of smallest to largest this year~ i finished harper's hat last night. i weaved in the ends and made the little tassle just before bed time so i thought i'd quickly try it on him and maybe take a photo or two. just as soon as i tied it under his chin he ripped it off and threw it on the ground and started to cry. hmmm, not exactly the response i was expecting. i was happy that after a full night of sleep he awoke with a new appreciation for his new hand knit hat. this is the giving pixie hat from little turtle knits. they are the cutest little hats, as you can clearly see! the yarn is super soft single ply merino from 100purewool. and i finished my cropped cardigan! this is 28thirty from zephyr style. the yarn is peace fleece in the grassroots colorway. i love the pattern, i love this yarn and i love my sweater! not so bad after all! i have to admit i was not at all ready for this week to begin. it started out pretty sluggish to put it mildly. back to our get-where-we-need-to-be-on-time routine. back to shuffling kids from here to there and back again. and back to football... oh, football how i have loathed you! riley has practice every single afternoon and does not get home until dinner time. then he does homework and goes to bed. i miss spending the evenings with my oldest child. i miss hearing all the funny things that happened throughout his day, as he is just to exhausted to share the stories with me now. he had a game last week and never even got to play. we silently drove home after the game, him disappointed and near tears. it broke my mama heart. anyway, after the initial hesitation this week has actually been pretty great. the kids have a short school week, no school on thursday or friday. yippee! my friend kim wrote a wonderful blog post about me and my organic products! and, riley had a football game last night. amazingly, harper slept through the entire game so i could actually sit down and watch instead of chasing him around the bleacher area, keeping him from approaching strange dogs, grabbing garbage out his little hands seconds before it reaches his mouth... riley was finally sent out with 5 minutes left in the game to play center (NOT a position for a little guy like riley!) and in the 30 seconds that the play lasted he broke through the line of huge guys and nearly sacked the quarterback! he was about 5 seconds too late getting to him. and that was it, the game was over a few minutes later. they won, 34-14. he emerged from the locker room and jumped in the van and immediately started talking about his great play. all he needed was that 30 seconds on the field to feel like a real part of the team. he was involved in their win. and that was all that was needed to make my mama heart swell!